The Curragh Racecourse and Irish Defence Forces will stage their annual race day on Sunday 11th October. Brig Gen Joe Mulligan, General Officer Commanding of the Defence Forces Training Camp was joined by Curragh Racecourse General Manager Paul Hensey and Lt Jennifer Larkin of the Army Equitation School to launch this exciting initiative, which aims to promote the close association between the Defence Forces and the racecourse. Defence Forces Race Day will feature seven races starting at 1.25pm including the 100,000 euro Tote Irish Cesarewitch and Waterford Testimonial Stakes for the Defence Forces Trophy. The Ireland v France World Cup rugby game will be shown on screens throughout the racecourse following the last race at4.45pm and anyone wearing an Irish rugby jersey will gain FREE admission. The 2015 Curragh season finishes on Tuesday 13th October with a competitive seven race programme featuring free admission for all race goers. Photo Caption – Brigadier General Joe Mulligan, General Officer Commanding of the Irish Defence Forces and Paul Hensey, General Manager of the Curragh Racecourse launch the 2015 Defence Forces Race Day taking place on Sunday 11th October. 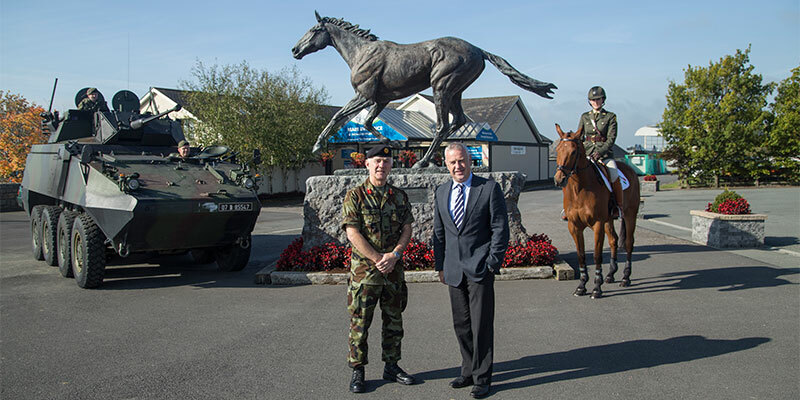 The initiative highlights the close association between the military and Curragh’s equestrian community.